Based in San Antonio, former USAA Executive Council member Dawn Johnson now serves as an independent marketing consultant. In addition to her work in marketing, Dawn Johnson supports local nonprofits, including the San Antonio Clubhouse. 1. Business Unit: Clubhouse members who participate in the Business Unit can learn valuable workplace skills, use computers to apply for jobs or housing, and connect with vocational rehabilitation programs. 2. Community Connections Unit: The Community Connections Unit conducts outreach programs to spread the word about the clubhouse’s work and keeps existing members informed about the organization’s events and new resources. 3. Culinary Unit: In the Culinary Unit, members work alongside cooking professionals to learn about healthy eating habits. They also contribute to the maintenance of the clubhouse vegetable and fruit garden. 4. Development Unit: Members who work with the Development Unit are responsible for helping the clubhouse raise funds, plan events, and conduct grant research. 5. Wellness Unit: The wellness unit provides members with a place to focus on health through participation in and planning of physical activities, as well as the management of the clubhouse’s snack bar. The founder and chief executive officer of DMJ Consulting, Dawn Johnson of San Antonio has previous experience with USAA Marketing. Previously involved with the San Antonio-based charity Haven for Hope, Dawn Johnson currently serves on the board of the Leukemia & Lymphoma Society (LLS). The world’s largest nonprofit health organization, the Leukemia & Lymphoma Society has been dedicated to curing leukemia, lymphoma, Hodgkin’s disease, and myeloma since 1949. 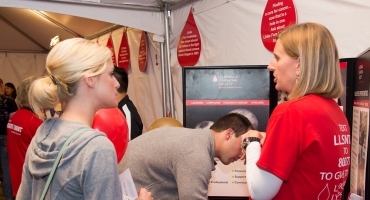 Committed to educating and helping patients afflicted with blood cancers and their families, the organization divides its efforts into several focus areas: research, public policy, and patient services, among others. Through therapy acceleration programs and the continued financing of academic research, the Leukemia & Lymphoma Society has expanded the realm of blood cancer research to include venture capitalists and pharmaceutical companies in addition to traditional academic collaborations and biotech partnerships. LLS also works to discover and increase outside funding for blood cancer research. For patients undergoing therapy, LLS strives to ensure they receive high-quality, well-coordinated treatments that are covered by insurance. The organization’s patient services are similarly designed to improve patient access to up-to-date therapies and trials. LLS serves as a central resource for cancer information and services and is able to address the varied support needs of patients and their families. To date, it has invested over $1 billion in blood cancer research.